Attorney Joseph R. Kemp has devoted his career to helping people in Pell City and the surrounding parts of Alabama overcome legal challenges. His practice areas include criminal defense, personal injury, workers' compensation, family law, adoption, estate planning, probate, and more. With more than 20 years of experience, there is little that can take him by surprise or intimidate him on the legal front. He knows how to get results in even the most complex cases. Joseph R. Kemp was born in Huntsville, Alabama, in 1965. His undergraduate work was at Birmingham-Southern College and at the University of Alabama, where he received a Bachelor of Science degree in Corporate Finance. He received his JD from Cumberland School of Law at Samford University in 1992. He was admitted to the Alabama State Bar Association in September of that year. He has also been admitted to the Southern, Middle and Northern United States District Courts. Joseph R. Kemp began his legal career as an associate attorney in the law office of David P. Shepherd. 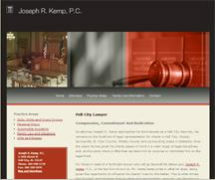 In 1996, he established the law office of Joseph R. Kemp, P.C., in Pell City. From criminal defense to personal injury and beyond, he prides himself on his ability to do what is right for his clients. Over the years, he has held prominent positions in key lawyer organizations. He has served on the board of trustees for a committee in the Alabama State Bar Association and as president of the St. Clair County Bar Association.